In the far reaches of outer-planetary space, Robin, Maid Marion and Giles are navigating their cargo ship back home to Sherwood, after a supply expedition. They're intercepted by a giant, robot bat that crashes into their ship, rupturing the fuel tank. With no access to the emergency fuel reserves--due to a broken pump--time is running out. They need to land somewhere, and fast! Thankfully, there's an uncharted asteroid nearby with an atmosphere, so they touch down for repairs. To Giles' dismay, they have arrived on a dark and stormy night, and before long, something outside starts to scratch at the ship's hatch! 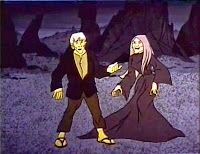 Turns out it's just Boris and his wife Esmeralda, two friendly residents who welcome the crew to Asteroid Mortula. Unfortunately, the only place with the facilities to repair their ship is Castle Mortula--and, as luck would have it, a stage coach driven by the couple's son, Montresor, arrives just in time to take them there. 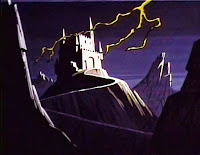 The trio are whisked off to the castle, despite Esmeralda's misgivings--because, on this night, the asteroid's orbit moves very close to the moons of Jupiter. While en route to their destination, exposure to one of the moons turns Montresor WILD! Although he doesn't undergo any physical transformation (into a werewolf), Montresor begins to howl at the moon; he loses control, and attacks the group. 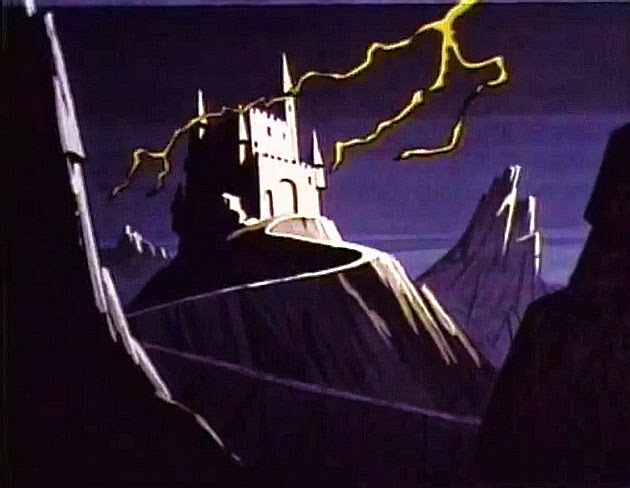 After a bumpy ride that features an extended fight sequence between Robin Hood and Montresor, the group arrives more or less unscathed to the home of Dr. Mortula. "My castle is at your disposal," he says with a smile, "enter." Inside, the guests are shocked to discover the same robotic bat that crashed into their ship--and it's named Bruno! Yet Mortula alleviates their fears, explaining that all will be revealed...after a hearty meal! But tensions elevate after the food is delivered by a ghostly butler, Logar (it turns out he's actually from another planet, where everyone is invisible). Mortula eventually fesses up to why he wanted Robin Hood and company to land on the asteroid. You see, years ago, the doctor discovered the secret to eternal life--he will live forever! But there was one unfortunate side effect: he can only live in darkness; if the sun touches him, he'll perish. So he blanketed the asteroid with a layer of thick, dark clouds, which allows him to move about freely--yet he's become weary of his surroundings, and wishes to move on. To do this safely, he plans to destroy the sun with his Super-Solar Extinguishing Device! But he needs the talents of Robin Hood to deliver the machine and execute his plan. Of course, Robin Hood refuses. But, as it turns out, Mortula has drugged the food, and swears that they'll never leave the asteroid alive! Now helpless, the trio are attacked by Bruno, the robot bat! 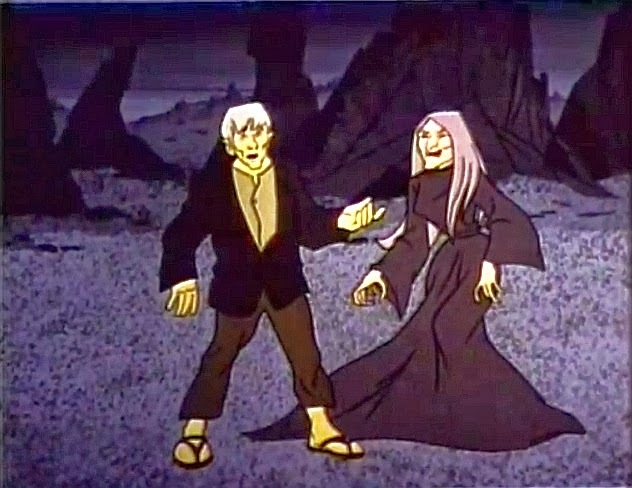 Thankfully, the quick-witted Robin Hood wasn't foolish enough to eat any of the food; he temporarily disables Bruno, and then escapes with his friends to the castle crypt. 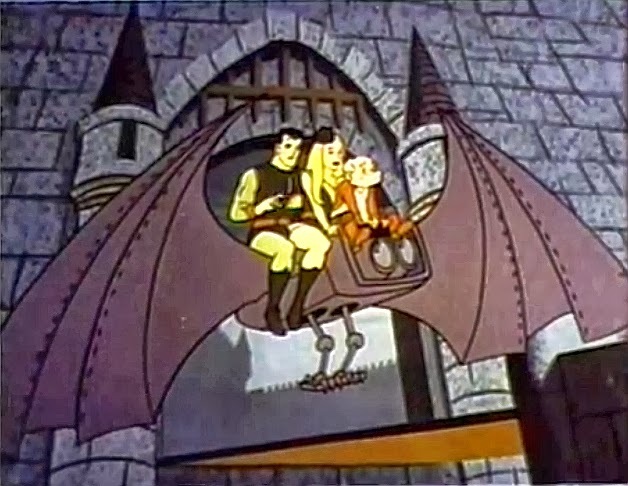 With the asteroid now out of range of Jupiter's moons, the heroes manage to reason with Montresor, who helps them flee back to their ship--on the wings of the robot bat! As they leave the planet, Robin Hood utilizes their remaining fuel reserves to blast a giant hole in the clouds over the asteroid--and the sun's rays penetrate down to the land below. This forces Mortula to flee into the caves underneath the surface, where he'll be imprisoned for the rest of his eternal life. 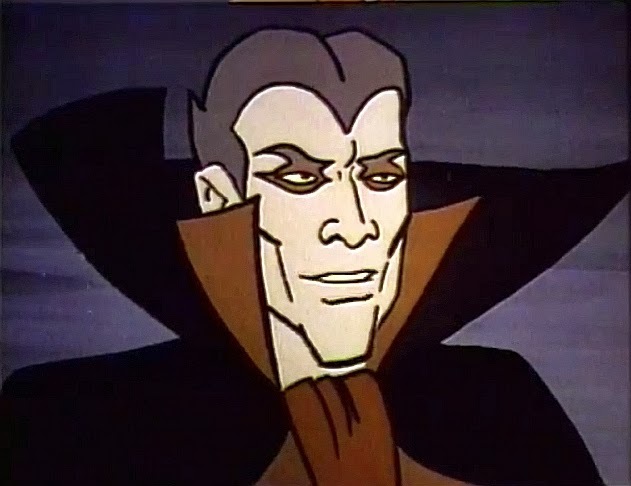 So ends this rather quirky episode of Rocket Robin Hood, which features characters based on Dracula (Mortula, who sounds like Bela Lugosi); The Wolf Man (Montresor, most likely a namesake of the villain in Edgar Allen Poe's The Cask of Amontillado); The Invisible Man (Logar); a Witch (Esmeralda); and even Frankenstein's monster (Boris, who sounds just like Boris Karloff).